No seats together on plane to Zurich. UGH……. Everything as clockwork on their trains though as you would expect with never more than 5 minutes waiting at any of the 3 stations we had to change at. Wonderful scenery and even some photo opportunities. Hotel Saratz a mixture of old and new with us in the old bits – perhaps if we were 40 we would be in the new bit! Bonus, Hotel has BBC1, BBC2, ITV 1 and all the other main UK channels! Used our free pass (not +60 age but hotel provided) to catch bus and to go up Muottas Muragl (2456m) on a cable railway that would have cost £20 EACH with our half price card! 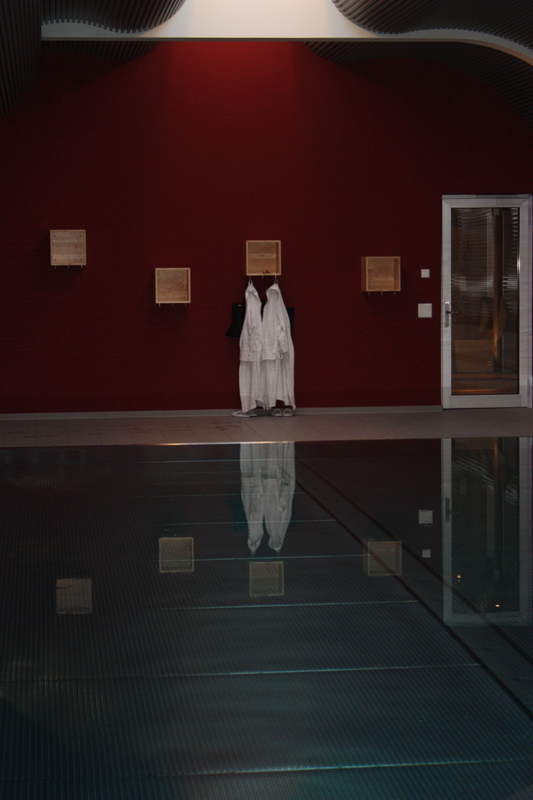 Thank you Hotel Saratz. 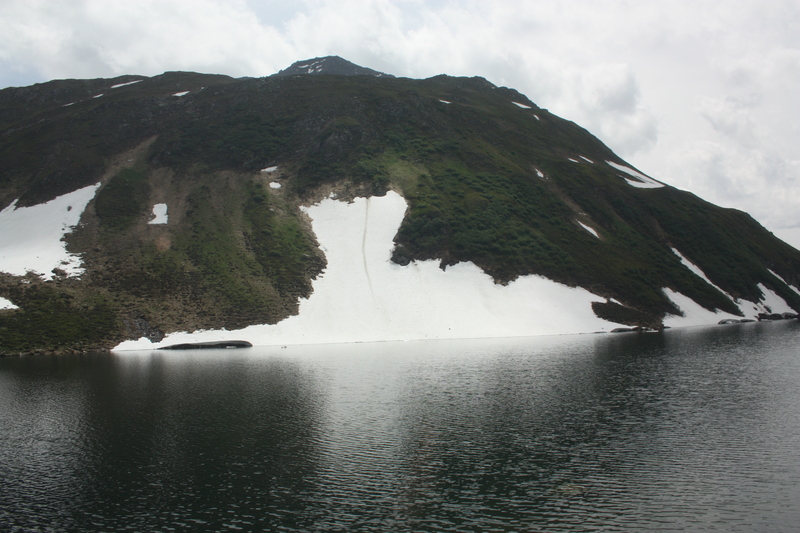 Now a hotel at the top of a mountain – that’s an idea that the IoM could follow (what’s that, they did many years ago!) but this is a 5* one called the Hotel Romantic which is why the cable railway keeps going into the night. Perhaps come back and stay there just for the experience one day. Trying to stick to new diabetic diet is complicated by all supermarket foods labeled in German – very frustrating. Sun out today and a few white parts now a slight shade of red. Hotel has all English channels so watching England on box from Switzerland with English commentary. But……. sods law, transmission fails just as England have a corner from which they score. Never saw the goal until a few minutes later – shades of Everton FA Cup a few years ago? Eat out tonight – cost 30 SFR less! I must admit that I had probably based my pre visit impressions of St Morritz from what we hear in the media but quite frankly it was absolutely disappointing. Shops for overpaid Bankers, no street cafe’s, roadworks in the middle of the town. We were in the “Dorf” part so walked to the “Bad” part. Not much better here although the Corvatsch restaurant served us a mean apple tart. Caught cable car up to “Signal” 2130 m but no further transport available. watched rack railway brake down about a mile away so that was no good. Caught bus back and fell asleep! Meal in Scena restaurant which was quirky with a sloping floor! 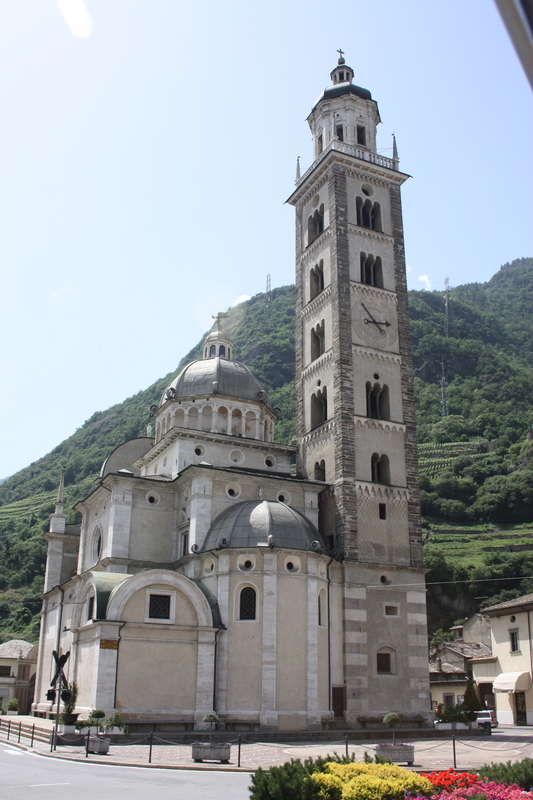 A visit to Tirano in Italy by train over the Bernina pass has cost us £50 between us which seemed a steal when you are able to sit in the front of the train, behind the driver looking out at the track before you and the journey took over 2 hours each way. Spectacular scenery is an understatement. As with many Swiss railway routes in the mountains you have to marvel at the engineers in the late 1800s who designed and built the first versions. The downside of the journey going was the other family in the compartment! The views were spectacular but to take photos was not easy through the sealed windows. Some steep curves, many drops in altitude down sides of mountains and many houses passed that you just wonder why they were built there in the first place. 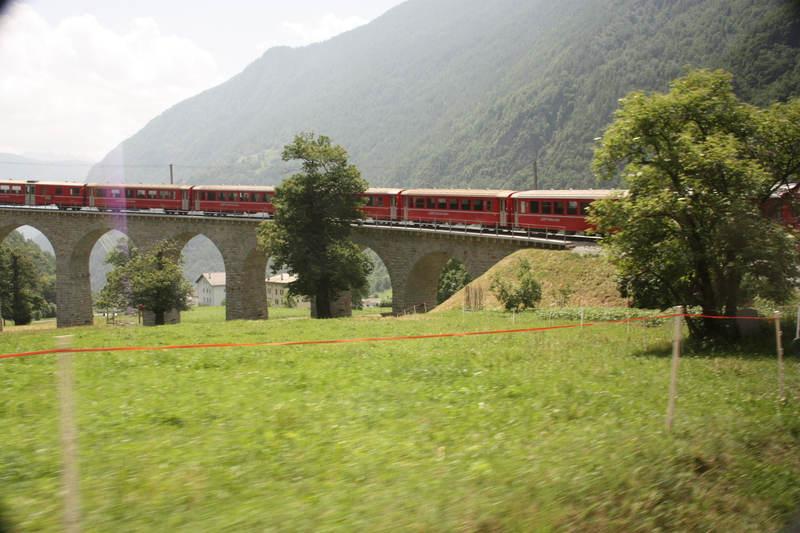 Round the circular viaduct that features on many a Swiss tourist authority poster for the area. Tirano was nice but we were not able to spend long there after a lunch that cost us under half of what it would have cost in Switzerland. Bought food on way back to hotel for a supper rather than eat in hotel – we are pensioners now so have to make savings! So, if you are going to do this, go 1st class in the front of the new type trains for the views and go in the older carriages for the photos out of the windows. 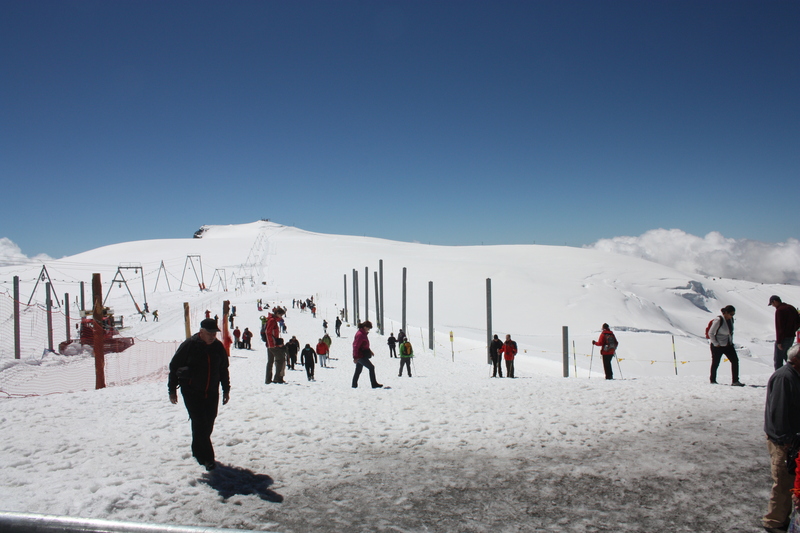 Up in ski-lift today – nearly had to go round again as forgot to take feet off bar at top. Nice walk along mostly flat track back towards Pontresina but didn’t take the whole 2.5 hour trek to Muottas Muragl. 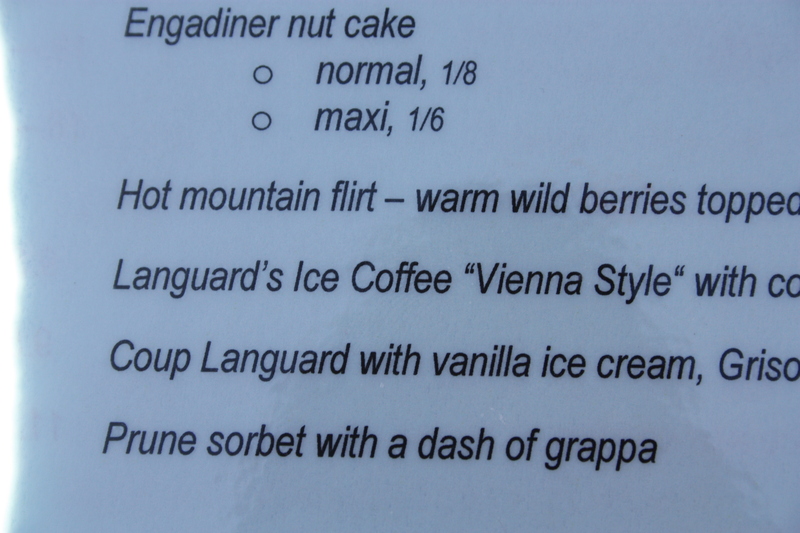 Back down after obliglatory coffee and a shared apple pie – must be close on my first sweet thing but should I have had the “flirt”? All shops closed in Pontresina – siesta – so lunch a tad late today. 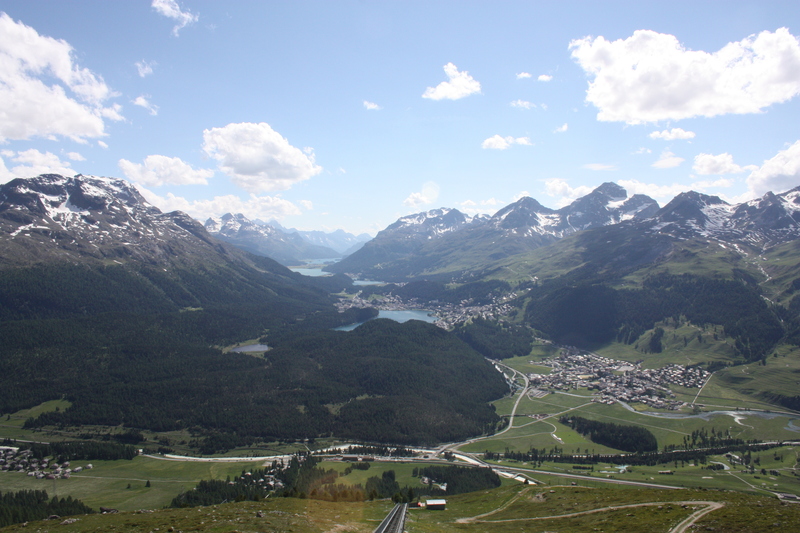 Walked down paths from Pontresina towards bottom of cable car railway to Muottas Muragl and went to top as we still could for free. Sights better today – air clearer. A Glacier – I have never had the opportunity to be up close and personal with a such a moving beast – yes they are supposed to move but I saw nothing of this. 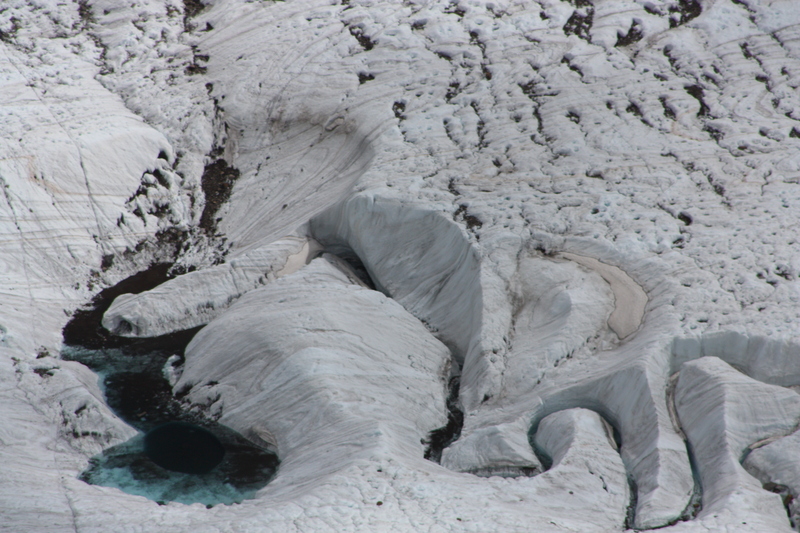 The Glacier in question was at Morteratsch towards Diavolezza. 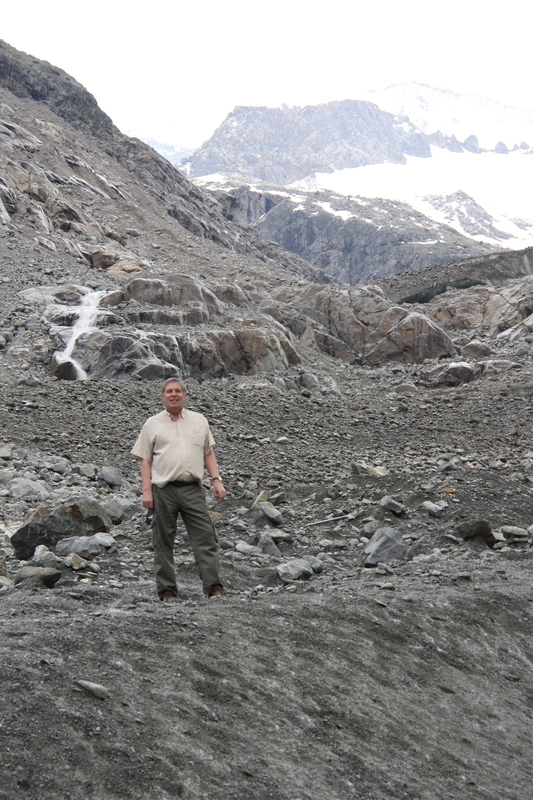 The hotel at the railway station was built about 100 years ago at the edge of the glacier but global warming has meant that it is now probably about a 1.6m trek to reach it most of which is slightly uphill. Sal did incredibly well to get as far as being able to see it all from about .5 mile away but I went on and stood on one arm of it having persuaded two Italian ladies to take a picture of me. Boy were we worn out when we reached the railway station hotel and had lunch. An earlyish start with taxi to St Moritz for the Glacier Express journey to Zermatt. Find our seat which for some unexplained reason were isle seats with no one sitting at the adjacent window seats! Conductor didn’t seem to be bothered so we just moved over to the window seats. Lunch served on train was pretty good considering. Whilst we had a good view all the way to Zermatt, the taking of photos was not so good due to the double glazed windows. 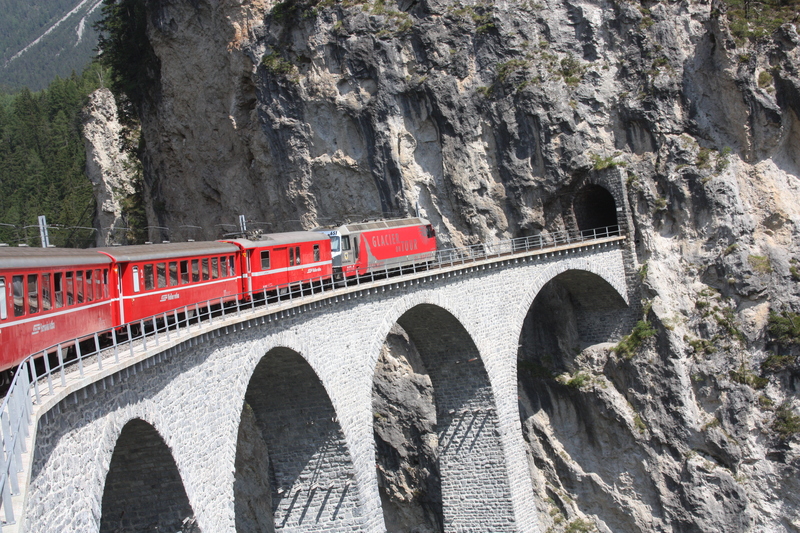 Again you have to marvel at why and how the engineers of the late 1800s developed the railway and it is an experience to cross from one side of Switzerland to the other. Zermatt is car free with a sort of park and ride at Tasch some two miles out. Picked up by electric buggy from hotel which is nothing like the one in Pontresina – we were spoilt there. No free public transport here so have to use our half price cards on the cog railway up to Gornergrat which is 3100m, some 1500m higher than Zermatt. Lots of snow at summit and good views of Matterhorn and surrounding mountains. Meal in hotel tonight slightly cheaper than in Pontrosina but still expensive and somewhat surprising is that the hotel’s pool is not exactly popular with other guests. Zermat very popular and busy, especially with Japanese but not that many in our hotel. A grey day. I know, let’s take the underground railway up the mountain and walk down. An underground railway at 1600m is not something I expected although it was cable operated. As with all undergrounds the train seemed to go very fast and the journey time only took 5 minutes for a 668m vertical rise. Coffee at cafe and nice leisurely walk down was the order of the day. How wrong that thought was! The map provided did have some paths marked on so we set off, quickly realising that the signposts here are not as good as they were in the Engadin region. First path was blocked by snow and the next path would have taken us a long way out of our way so we back tracked and followed a path down into the forest that I had seen a van use earlier. A large bang later (probably thunder) and it started to rain but we reached an opening in about 40 mins only to find that there would have been a shorter route. Now the fun starts (well “fun” is not really the right word). One route seems to be more direct and the other one backtracks up the valley & then down again but according to map then crosses valley to meet up at one of the stations on the Gurnergrat route. So, we take the direct route but it soon becomes apparent that this is more of a scramble although at least the rain was only in small showers by now. The terrain gets worse as we descend and there is definitely no way of going back – too steep – so we move gently on with hips and legs groaning with every step. Many others had come this way and frequent stops were made to let them through. Most acknowledged us in various languages and a French couple even offered us some refreshment. More ubiquitus Japanese with their sun hats and umbrellas doubling up as sun protectors. After what seemed an eternity we mad it to the top of Zermat only to find the signposted path disappearing the wrong way. Following on from a couple in front and a cyclist we followed the railway down some way, and made our way into town via an abandoned hotel by the railway. The descent took 4 hours and the “helpful” signpost told us it would take about 2! Exhausted, we had our meal at the hotel after long soaks in the bath rather than venture out to a local restaurant as we had planned. Just as well really as the weather was by now very fine drizzle. Slept well tonight! 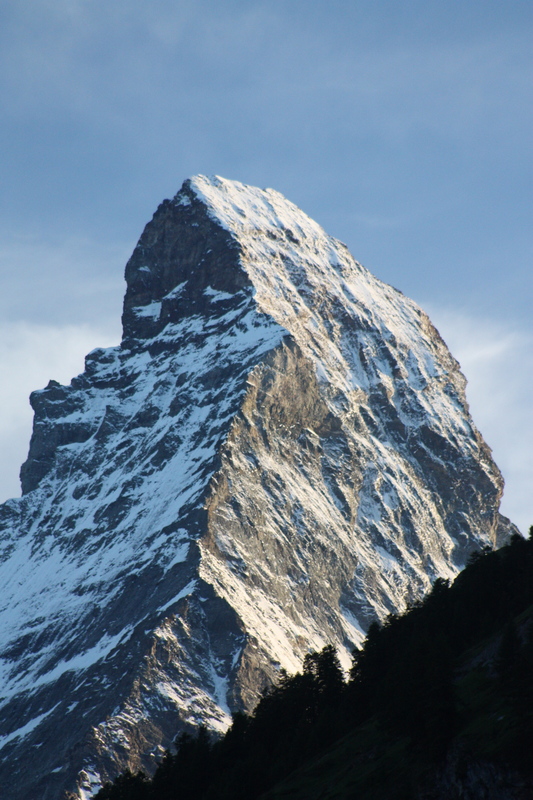 The Matterhorn is 4478m but you can only get up there by climbing and that is not something I have the technical knowledge to do! The next best is a series of cable cars that take you from Zermatt to near the Breithorn summit of 4165m which in old money is about 13000ft! Is this the highest cable car in the world? We are probably not quite at that height but still the air is rariefied and it is advisable to walk slowly. Sal does really well with her breathing and we manage a stroll in the snow whilst others a few yards away from us were snowboarding and skiing. Excellent weather, so clear views and signposts at the top show that Italy is not far away so some of the skiers probably are venturing across. 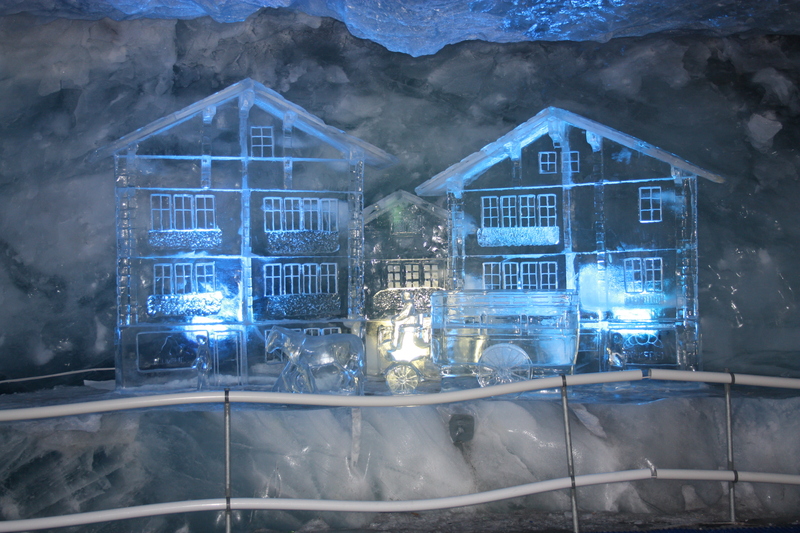 Visit Ice palace to see the sculptures under the ice – surreal experience! End of Switzerland trip with 4+ hour journey over mountains and by lakes to Geneva Airport. Just as well we had bought rools and water as there was no buffet on the journey. Quite a scenery contrast with the mountains as the first part back from Zermatt is moutainous but we change at Visp onto something bigger, faster and travel through valleys which are not exciting until Montreaux when we have Lac Leman (Lake Geneva!) to view. Very hot at Geneva airport and price of food at airport is even more expensive than in the country but we have to eat. Arrive at LHR next to the plane that has carried the Olympic torch around the UK, collect luggage and then on to the car park that is the M25. An hour with Flic in High Wycombe and then on to Liverpool for an overnight. Strange clouds as we go NWest up the M40 that look like mountains until we get closer and can see under them! Later we hear that there was vast flooding before we passed through. Glad to get to bed at 1am! A tad rough on the way back on the ferry, probably one of the worst fast ferry crossings we have experienced in many a year but we are good sailors. Two days and two half days left before we go off on our cruise! Quick turnaround on the washing but guess what, no sun to dry them. Thank good ness we have some extra clothes and a tumble dryer. This IoM weather is the absolute pits but probably no worse than the UK. My last day at work except that it is only a half day! Not sure what to expect really although I did retire for 9 days once before (from RBS/Coutts/NatWest) in 2002 this is definitely more permanent. Signed loads and loads of directorship resignation letters – Yippee. Not sure who is going to get my directorships but some will definitely go to Marion. Spoke to one client who said he would contact me after a while “when I was free”. I’m not getting a divorce I think – not that I know of anyway! Sad to not be speaking to some of the clients again, glad not to be dealing with others. Will miss the companionship of colleagues although no doubt will bump into many of them on occasions on the island. Hadn’t rehearsed any speech at all for a presentation as mind on other things. Lovely card and comments from colleagues and a nice contribution to my new lens for camera. No tears though unlike at Sally’s doctor’s surgery at the lunch for her – and those were from those still there. Trust me to choose a day to hold a retirement meal when England are playing in Euro 12. They don’t stand a chance in the competition anyway and as this is only a group stage there will be others. Here’s hoping they win though. Didn’t quite get soaked on way to Views for final meal but not far from it. Good meal and spoke to most people. Home at 11pm to unwind for the next “Journey”. The first day of retirement for both of us and what do we have to do? Alarm set and out of house by 9:20 to get medication from Chemist and off to Peel to see a man about a TV ariel @ Mel’s house! Difficult to avoid puddles on way with rain continuing – was it really Thursday evening when it last wasn’t raining? Now off to diabetes centre for visit to Dr K. At least he explained it in layman’s terms. Another Views visit tonight – this time for Sal’s retirement do. What a good idea the disposable cameras was with lots of photos taken for someone to put into a little book. No tears this time , just lots of hugs and kisses with the most popular words being “we’ll miss you” & “have a fantastic time, I’m jealous”. Just as well we packed our cases earlier as just too tired to do anything other than sleep afterwards. This is it. Off on the Ben to Heysham and the long slog down the UK’s motorways to Heathrow. Sometimes the motorways seem just like car-parks moving at a gentile 50mph. No rain which makes a change form the last few days. A bit of luxury at Heathrow as we opted for a stay and park at the Sofitel @ T5 before we fly off tomorrow. Ripped off at a Restaurant at T5 who shall remain nameless only because I can’t find the receipt. I mean to say, £9 for a large glass of red whine (sic). Visit to Nurse @ Doctor’s surgery – I have Diabetes Type 2!!!! That would hopefully explain the pain in my stomach /side and the thirstiness since the new year. Nurse talked and talked and quite frankly not much of it went in. The alternative diagnosis doesn’t bear thinking about. Took bikers out to Promenade shirts area and then phoned Sal. Big box of tablets now in my possession. (Added later: she didn’t tell me about the side effects). We have holidays booked to visit (apart from the UK) 13 countries between now and 2013 with many planned for 2013 – this is too much to take in!!! Spoke to Aviva but could only get specialist appointment on 16 June after I leave Trident, so not covered!!! Must make sure Trident pay me for the 5.5 days they owe me after 15 June. Well, another soggy day with no racing. Is the TT really finished? Our Homestay bikers left the house at about 9:30 to watch the racing. ‘Tis now nearly 6pm and the racing has only just started. Will they be bored with they get back? Why couldn`t they have done the racing today – lovely weather. My last week at work!!! Lovely to have the (Homestay) bikers still here. Dinner at La Piazza followed by drinks at Sir Normans. An absolutely fantastic evening with “les girls”. My last bus ride to work with Trevor – we never did put the world to rights!